What Intertops Sportsbook Bonus Code Should I Redeem? Which Intertops Coupon Code Do You Recommend? How Do I Redeem My Intertops Bonus Code? How Should I Make a Deposit at Intertops? How Do I Deposit via Credit Card at Intertops? How Do I Deposit via Bitcoin at Intertops? How Do I Get the $20 Sign-Up Free Bet? What Other Promotions Are Available to Me? Intertops is an award-winning online sportsbook that welcomes members from throughout the world, including the United States. Intertops is one of the most trusted names in gaming having been online for over 20 years! In addition to a broad selection of markets and wager types, Intertops has made a name for itself with excellent service and player promotions. With four Intertops Sports bonus codes to choose from, you can select the perfect sign-up bonus for you! Click here to visit the Intertops Sportsbook! Intertops welcomes all newcomers to their sportsbook with a first-deposit bonus. Better yet, there’s not just one bonus; there’s three, and you get to choose the one that fits your bankroll and preferences the best. To take advantage of any of them, you must be a new member who creates a valid account for the first time. Once your account has been established, make an initial deposit. The minimum amount of your deposit will depend on which welcome bonus you want to claim. The next step is to wager the full deposit amount. You can wager it all at once, or you can wager it over a number of different bets. For instance, deposit $50, and then, wager $50 on one bet, or wager $20, $10, $10, $5, $2, $2 and $1. Once you’ve done that, enter the appropriate bonus code — more on those in a moment — into live chat. You’ll immediately receive your bonus to wager as you choose. There are three bonus codes available: ROOKIE50, ROOKIE100 and ROOKIE200. ROOKIE50 matches any minimum or greater deposit by 50 percent up to $200. It has a 4x rollover requirement. ROOKIE100 matches any minimum or greater deposit by 100 percent up to $100. It has a 6x rollover requirement. ROOKIE200 matches any minimum or greater deposit by 200 percent up to $50. It has an 8x rollover requirement. The rollover requirement means that you must play through the deposit and bonus amounts by the rollover multiplier before you are eligible to make withdrawals on your account. Let’s say you deposit and wager $25 and then use ROOKIE200 in order to claim a $50 bonus. Your rollover requirement is 8 * ($25 + $50) or $600. Bets that count toward this requirement must be made at the odds of -200 (1.5) or greater and must settle. In addition, there is a maximum amount that any one bet can contribute toward the requirement. The limit is $50 for Rookie200, $100 for Rookie100 and $200 for Rookie50. Note: Deposits made with Neteller aren’t eligible for these sign-up bonuses. We personally prefer easy wagering or rollover requirements, so in this case, we would recommend redeeming the ROOKIE50 promo code. There is only a 4x wagering requirement, so you can quickly and easily satisfy this and not worry about being handcuffed when you are ready to make a withdrawal. The less restrictions, the better in our opinion. 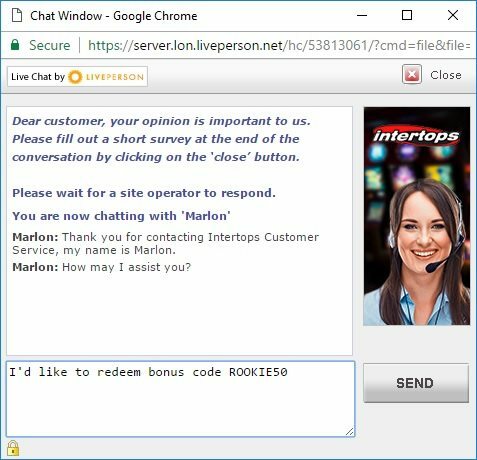 There is no form or prompt where you redeem your chosen Intertops Sportsbook bonus code, you must supply the bonus code to Intertops’ online support via live chat after you’ve made your first sports bet. From within your account, click the Live Chat button at the bottom right corner of your screen. Then in the chat box, tell customer service you would like to redeem whichever Intertops bonus code you prefer. Intertops supports several method of payments, but we recommend depositing either by credit card or Bitcoin – both deposit methods have no transaction fees and upper limits of $1,000. Intertops accepts all Visa, Mastercard, and American Express credit and debit cards. The credit card form is secure and immediate. 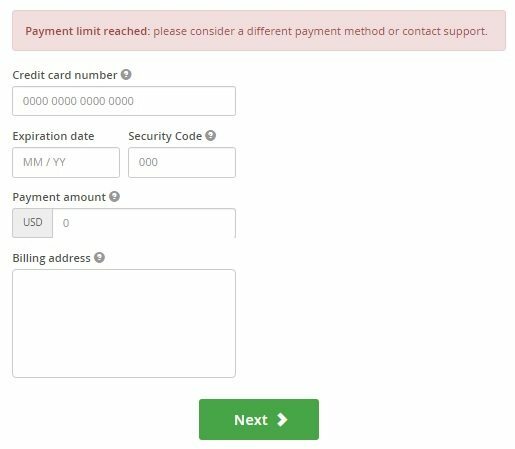 If you get a message that says “Payment limit reached: please consider a different payment method or contact support.” as shown above like I did, you will need to fill out the Intertops Credit Card Authorization Form to increase your deposit limits. You can download the Intertops Credit Card Authorization Form here. You will need to fill out this form anyway when you process a withdrawal, so all credit card customers have to fill out and fax in this form eventually. Intertops requires this step for your own protection and to prevent fraud. As an alternative, you can make a deposit via Bitcoin – which is our recommended deposit method. Buy Bitcoin – there are several different ways you can go about acquiring Bitcoin, but we think the easiest way is to open an account at Coinbase. Coinbase is similar to Paypal – you connect your bank account and you can immediately transfer funds and convert them to Bitcoin at the current rate. Open a Bitcoin Wallet at Blockchain.info – now visit https://blockchain.info/wallet/ and create an account here. Transfer Coinbase Bitcoin to Your Blockchain Account – this is a vital step because Coinbase does not allow for any gambling related transactions. So transfer your Bitcoin into your Blockchain account first. 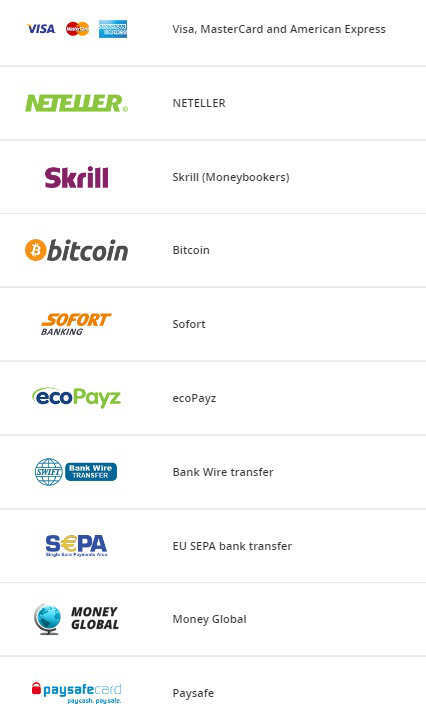 Deposit into your Intertops Account from Your Blockchain Account – now visit the Intertops Cashier, select Bitcoin, enter the dollar amount you would like to transfer via Bitcoin, and then Intertops will provide you the Bitcoin Wallet Address to send the funds to. From within your Blockchain account, send the exact amount to the provided Intertops Bitcoin Wallet Address. 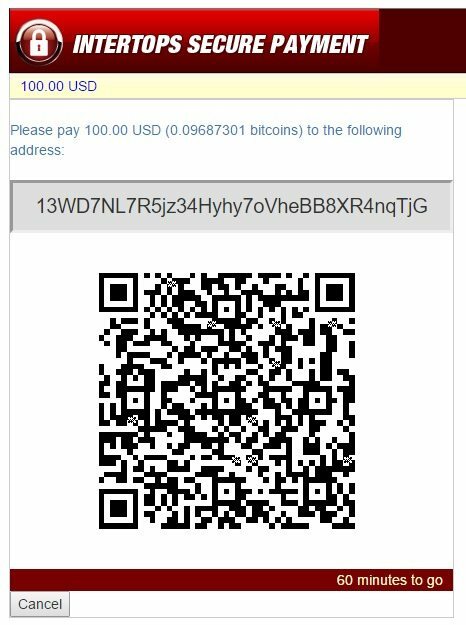 In the above example, you would then send 0.09687301 Bitcoins to address 13WD7NL7R5jz34Hyhy7oVheBB8XR4nqTjG from your Blockchain wallet. The process can take about 10-15 minutes, so be patient! Also, as a piece of advice, never disclose to any Bitcoin provider that you are depositing into Intertops! As an alternative to the welcome bonuses discussed above, Intertops provides all new members with a $20 risk-free bet. In order to be eligible, you must make a deposit of at least $20, and then, you must make your first wager in an amount of $20 or greater. Once you’ve done that, send an email to bet@intertops.eu with the subject line “$20 Sign-Up Free Bet.” You can send the email before the wager settles, and win or lose, the sportsbook will send you a $20 free bet within 24 hours of your email! Once you receive your free bet, you must wager it in full within 30 days. Once wagered, you must roll the sum over 16 times before you can request a withdrawal. In other words, you must play through $320 worth of deposits and/or winnings before your account is eligible for withdrawals. Intertops Sportbook offers weekly and monthly promotions, seasonal promotions, as well as regular ongoing offers to keep their customers excited and engaged. Find some of the current promos below. The Good Luck Giveaway lets members claim a bonus worth up to $50 every Thursday. In order to be eligible, you must have an account balance of $0.00 and have not made a withdrawal in the last 21 days. To claim the bonus, you must make a minimum deposit using a deposit method OTHER than a credit card. Once you’ve done that, send an email to bet@intertops.eu with the subject line “Thursday bonus.” The sportsbook will then match your deposit by 10 percent up to $50. This bonus does not have a wagering requirement associated with it but is a betting credit so must be played through once. Each month, Intertops challenges its members to find the parlay with the highest total odds. To claim a spot on the leaderboard, simply place a wager on that parlay. You don’t have to wager a lot. You can place the minimum bet. If at the end of the month your parlay has the greatest total odds, the sportsbook will award you $500. This is a cash bonus, which means that you can do with it what you please, including withdraw it! If you place a parlay with at least four selections and minimum total odds of +300 (4.0), then you’re eligible for parlay protection. If you wager loses due to just one incorrect tip, then you get one raffle ticket. You can win more than one raffle ticket. At the end of the week, the sportsbook will draw 20 lucky winners who then receive a $50 free bet that can be used on one or multiple bets. Intertops also hosts a Parlay Prince promotion each month, and this bonus is worth $1,000. Better yet, it’s a cash bonus, which means you can do with it as you please, including withdraw it without ever having played through it. The Parlay Prince for any given month is the member who achieve the highest net profit from a single parlay wager. Since parlays tend to pay out quite well, this is a nice little extra you have a shot at each time you place a multiple bet. Like many online casinos and sportsbooks, Intertops offers a refer-a-friend bonus. If a friend signs up using your referral code and makes a deposit, you get 10 percent of the amount deposited. For every fifth friend that you refer, you get 50 percent of the deposited amount instead! Inviting friends is easy, and there’s even a form on the website that will send that email for you. Get your bonus from Intertops Sportsbook today! You can find additional information on the latest Intertop bonus codes here. Be sure to also check out the Intertops Casino! You can find information on the Intertops Casino bonus codes here. I opened an account and followed your bitcoin instructions. I've never used bitcoin before but your guidelines helped me out and I successfully deposit into Intertops with bitcoin. Was all pretty smooth. Just had to wait a couple of days to verify my bank account with coinbase - they do those micro deposits like paypal does. Thanks people!